Keep In Touch. Sign Up To Receive Our Newsletter. Protects Property and Stops Break-Ins! When you’re rehabbing or restoring an existing property, our door and window guards protect your building and everything in it. With DAWGS, working on-site is safer than ever. Vacant and rehabbed properties are regularly targeted for theft. Protecting your investment with DAWGS keeps your property safe throughout the project. With DAWGS, rehabs are completed on-time and on budget, meaning more profits in your pocket. No Break-ins – Resulting in faster turnaround times, plus on-time, on-budget projects. DAWGS door guards feature a true 6-point locking system, just like a bank vault. Modular – DAWGS door guards can secure openings of any shape and size. No Lock Boxes or Key Management – DAWGS doors built-in 4 digit code eliminates the need to coordinate keys and lock boxes with realtors, contractors and tradesman. No Stolen Tools and Materials – A secure property means contractors can leave tool and materials in the property. This reduces the time and the cost of the rehab. 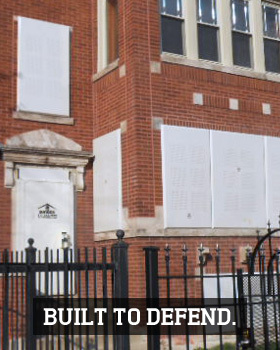 No Safety Concerns – Once inside the property, DAWGS doors can be locked from the inside so realtors and contractors feel safe showing or working in a vacant property. No matter the size and shape of your windows and doors, we have the DAWGS for you. Click here to contact our rental services department and learn more about your vacant property security options, or call us at 1-877-88-DAWGS (32947).